For years now, I've wanted to try paddle boarding. It wasn't something I knew about growing up as a kid in Florida, but it's hugely popular down there now and as the saying goes, all the kids are doing it. But you know me, just a big awkward ball of anxiety and self-doubt when it comes to trying new things. So I've found reasons to say no. And then flown home disappointed. And told no one. As I do. 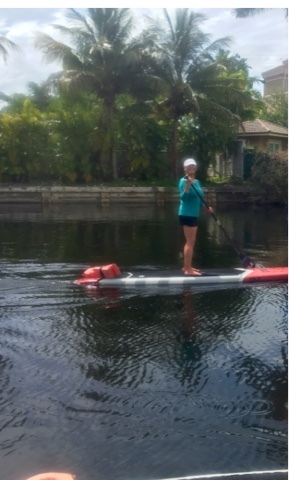 This year though, bestie Florida asked me if I wanted to try paddle boarding and even though I felt really nervous, I said yes! I did it. Have you caught on yet that saying yes is really my biggest hurdle in life? Once I say yes, I'm committed. But saying yes and dealing with all the internal anxiety of not knowing how the day or event will play out is what consumes me. That's why when I told you that this is my #yearofyes, it was a pretty stinkin' big deal. This year has been far from perfect. In fact, a lot of it has been pure crap. But I won't let that stop me from saying yes to making myself better and that includes saying yes to fun little adventures. So I said yes to paddle boarding. It was flippin' amazing! I bloody loved the entire experience! I was nervous and wobbly at first. We thankfully did not go in the ocean for my first time; rather we were in canals where the water was decidedly calmer. But almost immediately we had to go under a bridge which meant both going out and coming back we had to go from standing to kneeling and then back to standing on the other side of the bridge. And then almost immediately after the bridge at the start of our little paddle boarding adventure, there was a boat with a wake and a paranoid KK that I would fall in. But guess who didn't fall in? Me. Or...to be fair...any of us. But the girl had all been many times so that was hardly a victory for them. Do you know what else I did? I wore a bathing suit in public and didn't spend every minute beating myself up that I'm not skinny or beautiful or rocking a bikini or any of the other toxic girl garbage that happens inside my head. I just wore a bathing suit and had fun. It's amazing what can happen when I let go and just live a little! Cheers to my #yearofyes and saying yes to things that are fun, even if they are also a little bit scary! What have you done lately that was new or different or a little bit scary?